Striking United Hospital nurses Jennifer Mlodzik (L) and Linda Clute give blood at a union-sponsored blood drive near their picket line. Jennifer Mlodzik of Cottage Grove was among the first in line for a blood drive today near the United Hospital picket line, but she probably won’t be the last striking nurse who offers a little gallows humor to the Red Cross technicians. “Are you guys hiring?” Mlodzik asked the woman about to draw blood from her vein. As their open-ended strike at five Twin Cities facilities extended into its fifth day, Allina nurses are finding creative ways to keep their spirits up – and to continue to care for their communities. The blood drive, co-sponsored by the Minnesota Nurses Association and the St. Paul Regional Labor Federation, will run from 10 a.m. to 4 p.m. inside the new St. Paul Labor Center, located a block from United Hospital at 353 W. 7th St. Organizers, including United nurse Kelsey Swenson, expect a full slate of donors. Of course, nurses would rather be at the bedside, but Allina Health has shown it does not share nurses’ commitment to care – or to compromise at the bargaining table. The provider is spending millions of dollars on wages, travel expenses and lodging for replacement nurses to break the union’s strike. It’s estimated Allina will spend $20 million each week the nurses are on strike, even though the two sides are only about $2 million apart in negotiations, after nurses agreed to steep concessions in their health insurance benefits. 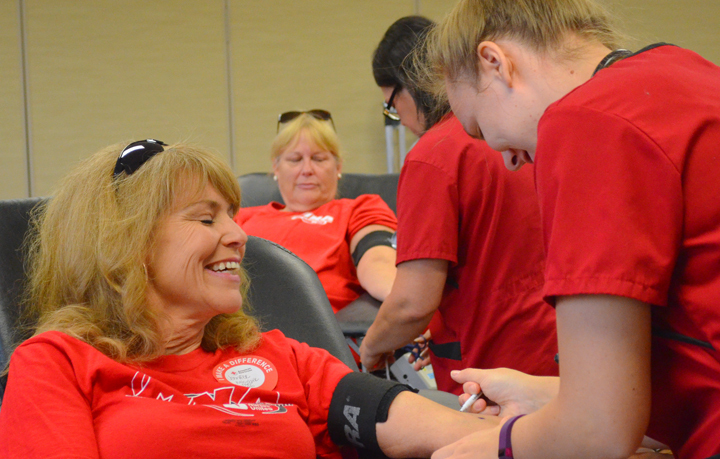 Linda Clute, a post-surgical nurse at United, said the blood drive was a silver lining to an otherwise difficult situation for herself and her colleagues.